How to protect and waterproof your external areas ? All external areas are subject to severe environment conditions which might affect our internal dry areas specially all related to leakage. Waterproofing the concrete structure is essential to avoid problems such as oxidation of steel and damages related to water infiltration.Weber proposes several waterproofing solutions for roofs ( exposed, covered, planted, insulated). 1. Waterproofing with polyurethane liquid membranes providing flexibility, solar reflective and easy to apply and maintain features. 2. Waterproofing with bituminous sheet membranes and cement based coating with resistance to indentations caused by traffic, better crack bridging and suitable for large flat roofs. Roof must be waterproofed durably and frost resistant. If you are growing plants on it; whether you will grow plants on containers, raised beds or on the roof itself. Waterproofing system is a must and should be first step to terrace garden construction as it protects the roof from leaking. 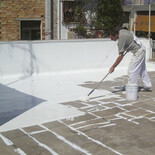 Waterproofing should cover up the entire surface of the roof. 1. Inverted roof system : consist of a waterproofing layer, insulation layer and finishing layer. with this arrangement , the roof waterproofing membranes remain protected from mechanical damage and against the direct influence of external factors. The temperature on the waterproofed surface remains stable regardless of the weather conditions. 2. California system : is an insulated walkable flat roofing, finished with white high reflective aluminium foil self-protected membrane with double layer waterproofing application in full bonding. 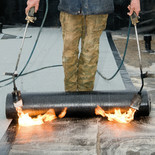 It gives a full waterproofing, thermal and sound solutions for roofing. When applying the bituminous sheet membranes , Biflex PL (SBS bituminous membrane) or Biplas PL (APP bituminous membrane) are the recommended products. Care should be taken for the stacking of materials. The rolls should be dispersed uniformly. They should be stored standing up. Any horizontal stacking of bituminous membranes on top of each others, might damage the materials, especially under sun heat. When applying the polyurethane liquid membranes , prime first with weberdry prime 310 PU and then apply the weberdry 360 PU. 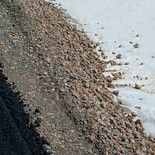 Once the first layer is applied and after 12-18 hours (not later than 48 hours) , apply another layer of weberdry 360 PU.